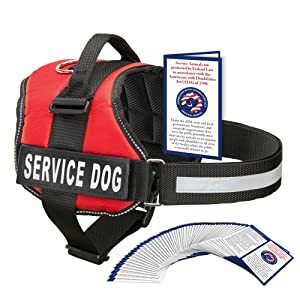 Best Service Dog Vest for a Daily Use - Top On The Market in 2019! Selecting a proper service dog vest is an essential part of a service dog working routine. Not only does it help to recognize a dog in service, but also allows the people with disabilities to perform their daily routines being sure everything is going smoothly. Scroll down to quickly find out about 6 best vests for service dogs! Or… Are you completely new to the subject? Here’s some additional information regarding the dog vests that you might need soon! Dogs can perform a plethora of various tasks. We all know that dogs can be excellent shepherds and hunters. There are also police dogs, rescue dogs, therapy dogs and many others. But none of them are service dogs. A service dog is a dog that has been specially trained to assist people with disabilities. According to the ADA (Americans with Disabilities Act), a service dog must be leashed, harnessed or tethered when in public. 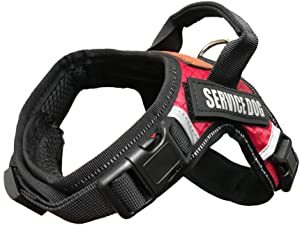 Although there is no restriction as to whether the dog should wear any specific gear, many service dog handlers use service dog vests and patches that were mainly designed for service animals. A well-chosen “jacket” is both convenient for the dogs and their handlers and saves a great deal of time and headache answering many disturbing questions they are being bombarded with during the day. Most commonly, service dogs are being trained for medical response and mobility assistance. It takes up to 3 years to teach such dog. A service dog is not a pet and cannot be separated from its handler – it should always follow them into any public entity to be able to do its job. This right is secured by the ADA Title II. The Title II also says that handlers are not obliged to provide any confirmation or details regarding their disability. However, if it’s not apparent that the dog is a service dog, a handler can be asked if the dog is a service dog and what kind of tasks it can perform. And that’s where service dog vests and harnesses come in handy. To maximize the benefits of your dog’s gear, make sure you’ve measured the dog appropriately before placing an order. Usually, vest manufacturers provide their product descriptions with a size chart, so all you need to do is to take correct measurements. Although the straps can be adjusted on most models, it is recommended to measure the chest (usually called girth), the neck and the length of the dog (also called “topline”). To measure the girth, put the dog on all fours and start from the withers, going down the side letting the tape measure right behind the dog’s front legs. Measure the neck just over the withers, going around the neck allowing 1″ or 2″ for more comfort of the dog. The top line is measured from the withers to the base of the tale. Watch this video for more tips on how to properly measure your dog. You might be surprised, but service dog vests can be used not only for service dogs exclusively. If you’re hiking or traveling with a dog, a jacket like this may come in handy, since you can always have some extra pouches to carry your stuff in. Sometimes such vest can be the best choice if you’re going on a car trip and want to secure the dog with a safety belt. Also, depending on what kind of task the dog is needed for, you can choose a vest with or without the bright. Thus, if you’re traveling in the dark or go camping, you will probably want your dog to be visible. But if you’re chasing someone or don’t want your position to be revealed – choose a plain vest with no reflective elements. A special patch indicates that the dog is on duty. Such items mean that you shouldn’t interact with the dog in order not to distract it from working. Please don’t use these patches or other similar decorations if your dog is not a service dog. By faking a dog, you’re faking a disability. That is illegal and can result in a fine, or even put you in jail. What distinguishes this Albcorp vest form other dog vests is its form and a decent quality. This vest is likely to become your best choice, as it is made of the heavy-duty materials and fitted with solid buckles. This model comes in a variety of sizes that can comfortably fit a dog of any size and shape from a Cup Poodle to a Greyhound. For the maximum comfort, measure your dog’s neck and girth and then consult the size chart. Made of durable nylon, this vest features two adjustable straps with plastic buckles that have lockers to prevent it from moving from side to side or slipping down while in use. Due to its shape, the vest might seem uncomfortable at first, but in fact, it’s decently padded. And if the size is correct, your dog will be thrilled to wear it. The vest features a steel D-ring and a comfortable handle and comes with two light-deflecting “Service Dog” Velcro patches. The size of the patches may vary according to the size of the vest: the bigger the vest, the larger the patches. In spite of many advantages, it is not recommended to let your dog swim in the vest. Being wet, the vest gets heavy and may become uncomfortable for the dog to wear. The mesh padding absorbs water and sweat and may start smelling when drying if not maintained properly. Other than that, the vest is perfect for camping, hiking or any other activity. Of course, you can also apply it directly as a service dog gear, too. This lightweight therapy dog vest is durable, soft and comfortable to maintain. 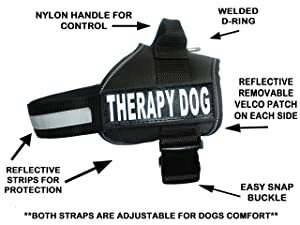 The patches are removable so that you can use this vest not only for therapy dogs but for any working dog. This vest comes in 6 sizes, but it suits best the more massive dogs, like retrievers, collies or royal poodles. But smaller breeds like pugs can also find it comfortable if they are hefty in the breast area. The vest is flexible and is designed to follow the natural shape of the dog, but it may not fit that well on the larger breeds. The vest is made of nylon and has a neoprene underside. Both of these materials are known for their high durability. This particular vest has a harness shape which means that it can be used for pulling dogs without causing them any harm. Still, it’s essential that the front strap falls on the breast not to strangle the animal. This will relieve pressure and facilitate its redistribution so the vest will serve longer and the dog will feel so much better. This vest can be used for therapy dogs on duty and therapy dogs in training. It is also useful for the dogs that accompany their owners while traveling, camping, and other outdoor leisure. Watch this video to see how the vest fits the old Jack Russel! Industrial Puppy is a company that specializes exclusively in service dog supplies and associated products. Although this vest looks pretty much the same as the previous one, there are still some apparent differences. 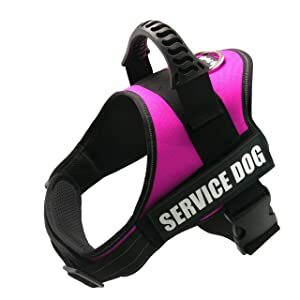 The back plate of this service dog vest is pretty wide, so it is most suitable for the more giant breeds like danes, retrievers or pointers. On smaller dogs, the vest may look somewhat loose unless the dog’s shoulders are broad as well as its chest and/or the straps are cinched tight. Please measure your animal carefully and consult the size chart before making a purchase. This vest comes in 8 sizes and is made of the heavy-duty nylon that includes mesh padding for the maximum comfort of your dog and easy maintenance. Unlike other similar vests, this one has a distinct advantage. There are two loops on each side of the handle to attach extra pockets. The pockets don’t come with a vest, though, so you’ll have to order them separately. This vest is suitable for the dogs in training as well as for those who are already in service. It is also useful for active outdoor activities like mountain hiking or camping. You can also use this vest during the car trips – the vest’s handle can be used for securing your dog with a seat belt. Watch this video review to find out more about the vest and see how well it fits a retriever. Please note that the pouches and the leash shown in the video are to be ordered separately. This is one of the most practical vests on this list. When it comes to carrying things, be it medical supplies or any other crucial equipment, there’s nothing better than a dog vest. This is quite a long vest that covers most of the dog’s body to provide extra protection for the dog’s coat and general structure. It has two adjustable straps to prevent shifting and hold it in place. One goes around the girth, another – around the belly. The vest comes in 4 sizes and may suit a dog of any size from chihuahua to German shepherd. 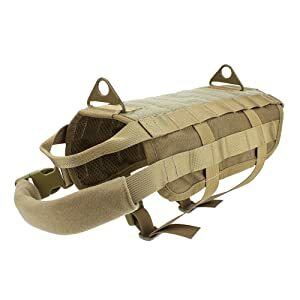 This tactical vest is made of 1000D nylon and has a decent amount of breathable mesh on the underside which will make your dog’s experience in this vest a breeze. There are two adjustable body straps with click clasps to prevent the vest from slipping off. There’s also a padded front strap to counterbalance the gear. The vest can be used as a service dog vest since it allows a lot of patches and is comfortable enough for a frequent and prolonged use. Although the material is not waterproof, it is sturdy and durable and is good for traveling, hiking and camping. This heavy-duty vest will stand any outdoor adventures for sure. A service dog vest by Fayogoo will be an excellent solution if you’re looking for something durable, lightweight and comfortable for your four-legged companion and yourself. The vest comes in 6 sizes and is suitable for all dogs as long as the measurements are taken correctly. However, this model seems to be the most suitable for medium breeds like welsh terriers or cocker spaniels. Also, the vest is not recommended for the dogs less than 8lb. In this video, you can see that the vest does not fit the dog which by no means is good since a moving vest cannot be efficient. Made of the robust Polyester Oxford fabric, the vest is easy to maintain, although the machine wash is not recommended. This model features a rubber grab handle, which provides additional control and may be used for mobility assistance. There are also two adjustable straps with snap buckles for custom fit. Snap buckles equipped with a security locker to avoid accidental unbuckling. This bright service dog vest can be used for both service dogs and the dogs in training. By adding new patches, you can also turn this vest into a therapy dog vest or an emotional support dog vest. It will come in handy for travelers, campers, hikers and everyone who wants their dog to be safe and happy. This tactical vest by Hanshngday is a gem for those who frequently engage in outdoor activities or who needs their companion to hold various supplies. This is a big long vest designed specifically for the dogs to carry things. It is available in only 2 dimensions. Therefore, it is best for more giant breeds, like German shepherds, huskies or malamutes. The adjustable straps provide a snug fit, but the vest may not be as tight on thinner dogs in general. This vest is made of the heavy-duty, lasting materials and comes with 2 attachable pouches: a square medical bag can make a good trauma kit, and the tall one is suitable for carrying a bottle and/or canisters. The vest itself features PALS webbing on both sides to adjust pouches, a Velcro panel for patches and an elastic string for bottles or any other more abundant supplies. There is also an excellent drawstring bag for a handler to match the outfit of their companion. A tactical vest like this is a must-have for travelers and explorers who like to take their furry friend on their trips. The Rip-Stop material doesn’t wear off and is easy to maintain. The breathable mesh padding allows long distance runs with the maximum comfort for the dog. 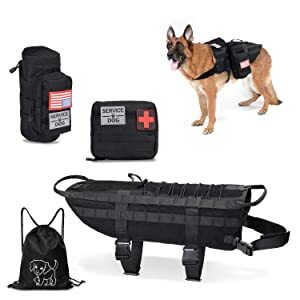 The jacket can be also used as a service dog vest or a working dog vest – it has a lot of room for patches and pouches can hold any of the necessary supplies. It may take some time to get used to balancing the supplies and adjusting the straps, but with that done, the vest shall become an indispensable item in your adventures and daily activities. Service dog vests come in all different shapes and sizes. Lately, it has become a sad trend for dog owners to dress up their pets as service dogs because they know that a service dog has exclusive access rights to any “no-dog” public facilities. Unfortunately, such actions can only be frowned upon for such imposture is a fraud and discredits the real service dog handlers. True service dog training takes up to 3 years and is very costly. These dogs take numerous tests to become approved, professional companions for those who really need them. Service dogs are trained to act as if they are not there at all not to draw attention to their handler’s disability. That’s why they have all those patches on their vests that ask strangers to refrain from any petting, talking or making a direct eye contact with the dog. A service dog is not a pet and has to stay firmly focused on its handler to provide the first response if needed. How can a dog do that when so many people are craving for interaction? A service dog vest is not only a handler’s fancy. It is an indispensable accessory that helps recognize a dog in service and informs bypassers that contacts with the dog are unwanted. On the other hand, a vest or a harness is a practical item for travelers, hikers, explorers, campers and anybody who is used to go on adventures with their pooch. Just like a service dog vest, a traveler dog vest has to be handy, durable and comfortable. It can also have a firm or a soft handle to facilitate mobility or merely to help the dog itself to cross the extreme passages. A traveler dog vest can also help pouches to store and carry medical supplies and other essential items. The most prominent and important traits of such jackets are the unique patches. So, if you’re not a service dog handler, neither is your dog is in training to become one, please, do not wear the distinctive patches that often come together with the vest you’re purchasing. By choosing to leave a patch fastened to your pup’s vest, you’re committing a crime and abusing those for whom their dog is indeed an essential and crucial necessity. Please treat others with respect and choose the products wisely. I hope you enjoyed the article and found these reviews useful. Feel free to leave a comment and share your experience in a section below. Top List of Self-cleaning Litter Boxes Here: Comparison and Buyer’s Guide!